Radon is a radioactive gas that is naturally produced in the ground from the uranium present in small quantities in all rocks and soils. Humans cannot smell, see or taste radon. It produces tiny radioactive particles when it breaks down (decays). These particles, when inhaled, are deposited in the airways and on lung tissues. This results in a radiation dose that can cause lung cancer. The risk of contracting cancer is related to how much radon you have been exposed to and for how long. Radon is in the same group of carcinogens as asbestos and tobacco smoke. Radon is classified as a Group 1 carcinogen by the International Agency for Research on Cancer, a part of the World Health Organisation. In the open air radon is quickly diluted to harmless concentrations. When it enters an enclosed space, such as a house, through small cracks in floors and through gaps around pipes or cables, concentration levels can become unacceptably high. Radon tends to be sucked from the ground into a building because the indoor air pressure is usually slightly lower than outdoors. Radon remediation works either by preventing the entry of radon into a building from the soil or by removing it after it has entered. The most appropriate method will depend on a number of factors including gas concentration and building type. A ProAir ventilation system was installed to establish its effectiveness in a property with a radon reading of 350Bq/m3. The target was to reduce it below the National Reference Level of 200Bq/m3. Independent testing was done before and after system installation to ensure unbiased verified results. 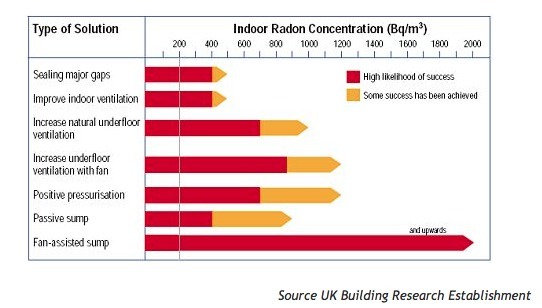 Radon levels dropped to 162Bq/m3 after installing the ProAir HRV system with the added benefits of reducing heating costs, eliminating condensation and substantially improving the indoor air quality. See here for results before and after Heat Recovery Ventilation system installation.